Go to the first tab on the Engage ribbon (which corresponds to the type of interaction you're building), then click Player. 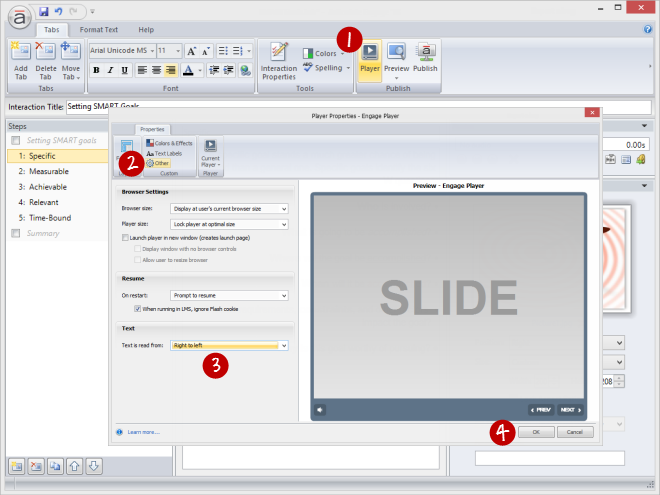 Tip: In Update 3 and later for Articulate Engage '13, the previous and next player buttons are reversed when text is read from right to left. Engage saves player customizations in your interaction file. It's a good practice, though, to save your player separately, so you can apply the same player customizations to other interactions. 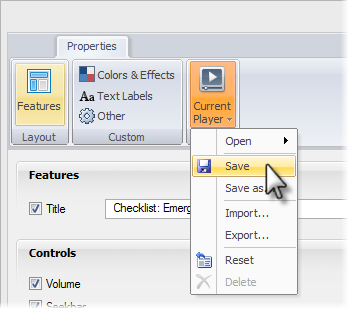 To save your player, click Current Player on the Player Properties window and choose Save. Enter a name for your custom player if prompted and click OK. The steps above change the text direction for player elements, such as buttons and messages. To display the actual content of your interaction in a right-to-left orientation, make sure the Right-to-Left Text Direction button is selected when you enter or edit text. You'll find this button on the Format Text tab on the Engage ribbon—but it'll only appear if you have a right-to-left keyboard input language installed on your computer. Note: Step titles can't be displayed in a right-to-left orientation. However, you can remove the steps titles if you'd prefer. Just delete the text in each step title.